Rocket Lab's second Electron rocket "Still Testing" stood vertical ahead of its successful launch in January. WASHINGTON — Satellite rideshare company Spaceflight Inc. on June 11 signed on as the anchor customer for three Electron launches from Rocket Lab. Spaceflight President Curt Blake told SpaceNews the company bought the "vast majority" of the lift capacity on all three missions, giving Spaceflight control of the schedule for each. Blake declined to say if Spaceflight received a discount for placing a three-launch order. 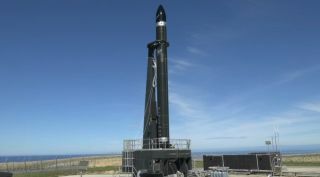 Spaceflight's first Electron launch is slated for late this year, followed by the second and third in early 2019, each from Rocket Lab's New Zealand spaceport. Rocket Lab, which has reached orbit with Electron just once in two attempts, is shooting for its third launch no earlier than June 22.
Notable customers on the new missions include Spaceflight Industries' own BlackSky and Japanese camera company Canon Electronics. The first Electron launch will carry a BlackSky Earth-observation satellite, along with other spacecraft. Spaceflight Industries raised $150 million in March to fund the first 20 satellites in a planned constellation of 60 satellites. Spaceflight launched a demo satellite in 2016 on an Indian Polar Satellite Launch Vehicle. A Canon satellite called CE-SAT-I Mark 2 will launch on the third Spaceflight-controlled Electron launch. Nobutada Sako, group executive of Canon's Satellite Systems Lab, said the satellite "is our first mass-production model," and carries two cameras of differing resolutions. CE-SAT-I Mark 2 follows the experimental CE-SAT-I, which launched in 2017 also on an Indian PSLV. Spaceflight's second launch of the trio will carry unspecified spacecraft from "commercial and government organizations," the company said. Spaceflight previously bought a dedicated Electron launch in 2017, but has not said when that mission will occur. Blake said dedicated missions with small and medium-sized launch vehicles are becoming more important for Spaceflight. "There will be more for sure," he said. Spaceflight's biggest dedicated mission, a SpaceX Falcon 9 launch called SSO-A, is scheduled for early fall, he said.